Although I read all of the Harry Potter series when they first came out, I totally missed the part about Harry's favorite dessert being treacle tarts. I read the first few when I was very young and then ripped through the new ones because I was dying to know what happens. I enjoyed reading the series... It was a fun ride but I never got caught up in the craze; it just wasn't my favorite. I remember building a fort (a thin blanket between the bookshelf and the couch) in my old bungalow in India, and sitting inside reading The Secret Seven or The Famous Five eagerly trying to solve the mysteries before they did. I was enthralled with The Magic Faraway Tree series, about a tree in a forest that had changing lands at the very top. The Malory Towers books about girls in boarding school made me long for my parents to send me somewhere just like it while The Secret series about three children who ran away to a secret island and lived on their own excited and thrilled me. The books were written modestly but they were so captivating for my little pre-teen brain, just the thought of ordinary children on extraordinary adventures. I treasured all my personal copies for years, but after I moved to the US my grandmother donated all of them to the library. As disappointed as I was, I'm glad they can be read by other children and I hope they're relishing every word like I did. One of the best parts of Blyton's books were the way she described food; she no doubt instilled immediate hunger in her readers with her way of writing. One excerpt from a book from The Famous Five series talks about a picnic they have; "tomato sandwiches, lemonade, tinned sardines, melt-in-the-mouth shortbread, lettuces, radishes, Nestlé milk, ginger beer, tins of pineapple chunks, squares of chocolate." That's my kind of picnic. From The Secret Island: "Peas in their pods, cupful after cupful of creamy milk, sweet juicy raspberries with thick yellow cream, radishes so hot even Jack's eyes watered as he ate them, deep red strawberries and fine mushrooms." The made-up foods in The Magic Faraway Tree series were my favorites though... pop biscuits, google buns, hot-cold goodies, well-I-never rolls... I could have drooled over these imaginary goodies for days. There were also a few real foods I didn't understand, like treacle, ginger buns, or jammy buns. Treacle is a type of sweetener syrup, also known as golden syrup. It's really just water and sugar cooked for a long time, not the same as corn syrup or as strong as molasses. It's been mentioned in Alice in Wonderland as well as Harry Potter. 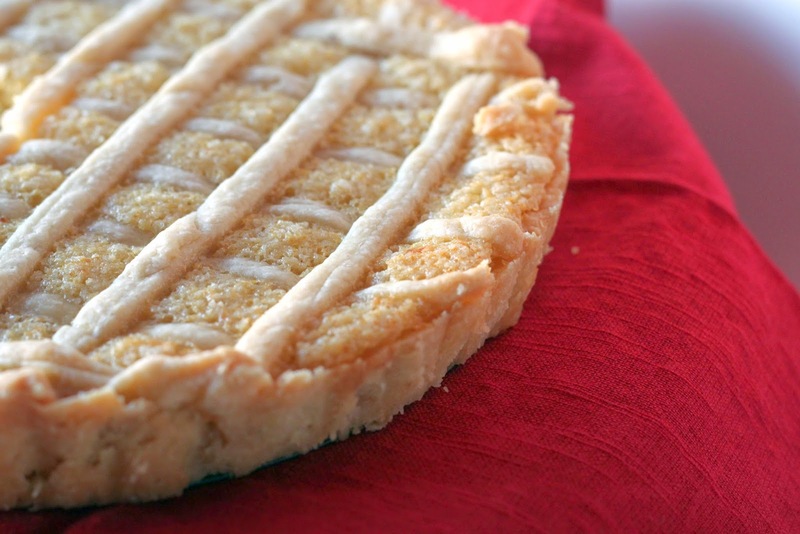 A treacle tart is basically a sweet pastry crust with treacle, breadcrumbs, ginger, and some lemon juice to curb the sweetness. The second I tasted it, I loved it, but I wished I had added a vanilla bean to the flavoring. It would have really elevated it, but then it also wouldn't be the original treacle tart, at least not the one Blyton was most likely referring to. I found that golden syrup is easily purchased, as is black treacle... well, easy for those in the UK. I would have had to custom-order it so instead I made my own version of golden syrup, after doing a bit of research. It was deliciously sweet and thickened well as it cooled. Also, the only breadcrumbs I had on hand were Panko ones... I was a bit apprehensive at using them but it was either that or grinding up my whole wheat grain bread. I chose Panko. Heat the 100g sugar and 25g water in a saucepan. On medium heat, allow the mixture turn a deep golden color. Add the boiling water (gently, it may sizzle), the sugar, and the lemon. On low heat, let it simmer for 45 minutes to an hour. If you have a candy thermometer, let it reach about 230 degrees F and sit. It may seem watery but when it cools it thickens! Cool and store away in your kitchen larder (pantry). *A sweet pastry crust is suggested but I thought the treacle was sweet enough... it turned out just right for us. Roll out the crust onto the tart pan and save some of the trimmings to decorate the top. Place parchment paper and weights on top. Roll out the trimmed edges and cut into long strips. Combine all the ingrdients in a bowl and whisk together. Pour into the cooled crust and place any latticed strips on top. Bake for 20 minutes at 350 degrees F, or until the filling is set. Eat warm with ice cream, fresh fruit or whipped cream. Glad someone finally decided to figure out what treacle is - looks delicious!